It is hard to over-emphasize the cultural significance of the classic film Breakfast at Tiffany’s. The comedic-yet-tragic story follows the transformation of Holly Golightly (played by Audrey Hepburn) from Texan wild child to a refined and polished wannabe-socialite– a title she hopes to achieve through questionable means. 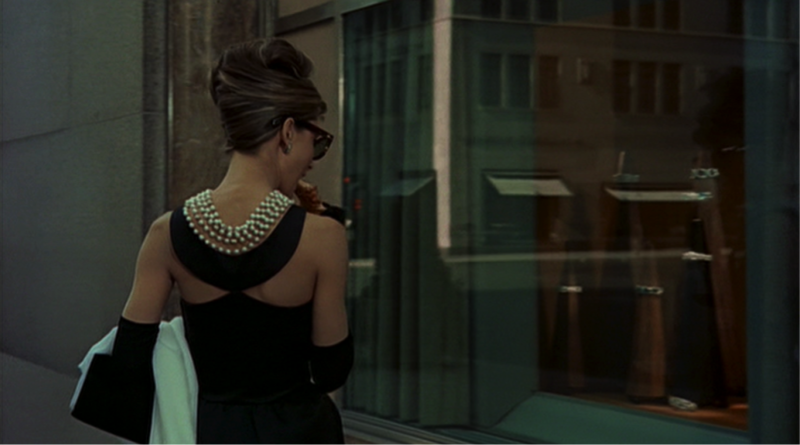 Meanwhile, Holly Golightly’s wardrobe has become a coveted and admired collection unto itself. We explore the iconic costumes and jewelry that were such an integral and significant part of the film. The audience is introduced to the striking Ms. Golightly as she elegantly steps out of her cab in the wee hours of the morning and seemingly floats towards the New York Tiffany & Co. store windows. Her column dress was designed by famed French designer Hubert de Givenchy, a personal friend of Audrey Hepburn. The dress was so fitted for Hepburn’s narrow frame, two were actually made: one for standing at the windows and one for walking which had a long slit down the side. Holly dons a pair of satin elbow-length gloves, her tortoiseshell Oliver Goldsmith sunglasses and ropes and ropes of pearls. Her layered pearl necklace was designed by Roger Scemama. Scemama was a French jewelry designer who frequently collaborated with the haute-couture design houses including Givenchy, Dior, Lanvin, and Yves Saint Laurent. The necklace neatly falls down Hepburn’s shoulders and back to emphasize the low-cut back of the dress. 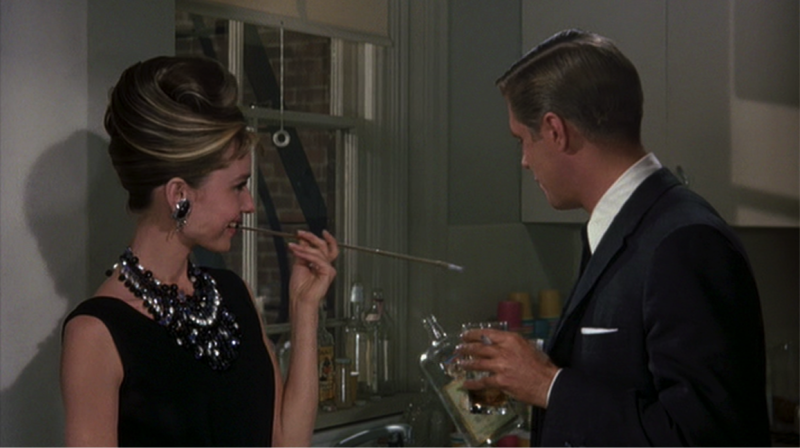 Early in the film, Holly Golightly invites her neighbor Paul Varjak(played by George Peppard) over for a drink at her apartment. The party quickly escalates from a low-key happy hour to a debaucherous and booze-fueled bash. Even in the apartment packed with party-goers, Holly shines and stands out in her little black dress and statement necklace. This LBD is the film’s second design by Givenchy. This day dress is made in a cloqué silk and is so refined in its simplicity, hugging Hepburn’s willow frame, before it flirtingly flares out at her knees. Devotees will notice: Holly wears the same dress when she first meets her new neighbor Paul. Paul is mystified by Holly’s unusual lifestyle and, when Holly pairs her black dress with a wide-brimmed hat and over-sized sunglasses, her look only heightens her enigmatic allure. 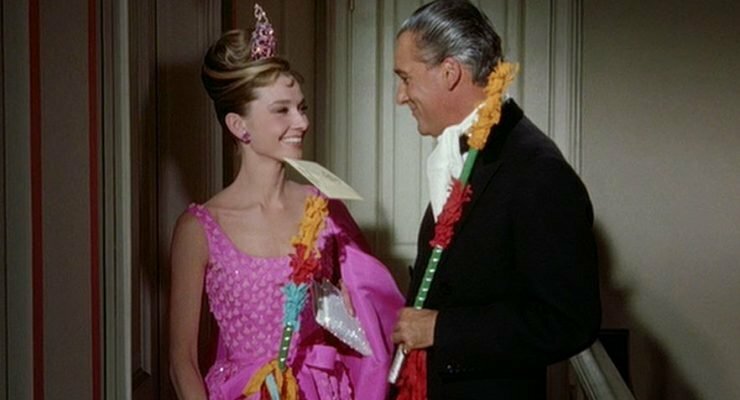 The audience sees the dress again (this time with a campy hat and brilliant diamond earrings) when Holly learns her ex-husband Doc Golightly is in New York. For her party, though, Holly wears her trusted dress with an impressive-looking bib necklace. The necklace is made of glass beads, plastic pearls and black painted enamel chains. It is most definitely a piece of costume jewelry. Although the designer is not known, most credit its general concept to Breakfast at Tiffany’s costume designer Edith Head. And we cannot overlook Holly’s hairdo; her party look is complete with blonde streaks that accentuate the height of her bouffant. In a pivotal scene, Holly returns to her apartment with her new Brazilian beau Jose da Silva Pereira (played by José Luis de Vilallonga). The couple have been out partying but her happiness is snuffed out when she reads a telegram informing her that her beloved brother Fred was killed in a Jeep accident while serving in the war. Holly’s brilliant and cheerfully pink dress stands in sharp contrast to her crushing grief. This hot pink silk cocktail dress is dotted with fan-shaped green rhinestones and a wide pink ribbon belt, tied in an over-sized bow. Casually draped over her shoulder is a matching pink collarless, three-quarter sleeved coat. To finish her cheeky outfit, a pink rhinestone tiara is perched in Holly’s up-do. The dress sold at a Christie’s auction in 2007 for a whopping $192,000 USD—more than six times its pre-sale estimate.